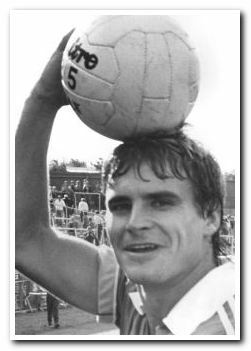 A proven goal-scorer, Kemp notched 28 goals for Argyle in the 1980–81 season, and was named Player of the Season. He was always a threat in the penalty box and, like all good strikers, loved nothing more than scoring goals. His professional career began at Crystal Palace after being released by Chelsea as a schoolboy. He had also spent time with Harrow Borough, Maidenhead United and Slough Town. His form at Palace led to a move to Portsmouth but despite scoring 30 goals in just 18 months he was sold to Carlisle United. He continued in the same vein at Carlisle and this led to Argyle breaking the club record fee to bring him to Home Park. A loss of form saw him lose his place in 1981-82 and after loan spells with Brentford and Gillingham he was released. In June 1982, Kemp left England to play in the North American Soccer League (NASL), spending one season with the Edmonton Drillers and one with Seattle Sounders, as well as playing for Tulsa Roughnecks and Chicago Sting (both of whom played in the indoor variant of the NASL). In 1984 he left the NASL, which was fading fast, to play for Oklahoma City Stampede in the even more short-lived United Soccer League. He briefly re-registered with Wimbledon in 1984 but didn’t make any additional appearances for the side. Having retired as a player, Dave Kemp's first managerial position was with Swedish club Norrkoping. In 1986 he returned to England and served on the coaching staff at Wimbledon. In March 1990 he was appointed as Argyle's manager and that summer, partly utilising Kemp’s connections, the club went on a pre-season tour of Sweden. Kemp's first few weeks in charge of the Pilgrims saw an unbeaten run of eight matches which ensured Second Division safety. For the remainder of his time, though, a reliance on the long-ball game, played mostly by loanees and cheap signings, gave the fans little to cheer about, and he was dismissed in February 1992. After leaving Home Park, Kemp held coaching and managerial positions with Slough Town, Crystal Palace, Wycombe Wanderers, Wimbledon, Millwall, Portsmouth, Oxford United and Leicester City. In August 2004 he became first team coach at Stoke City, working under Tony Pulis, a partnership that had begun at Portsmouth. When Pulis was appointed as Argyle's manager in 2005, Kemp returned with him to Home Park, and stayed back at the club until August 2006, when he re-joined Pulis as assistant manager at Stoke City. Under their leadership, Stoke were promoted to the Premier League in 2008, but Kemp was relegated to chief scout when Peter Reid was appointed as assistant manager. In July 2010, when Reid left Stoke to become manager at Home Park, Pulis again appointed Kemp as his assistant. He left Stoke at the end of the 2012-13 season and followed Pulis to Crystal Palace in January 2014 and then on to West Bromwich Albion in January 2015. Leaving the Hawthorns in July 2017, Kemp announced his retirement from football at the age of 64, to live full-time at his family home in Sacramento, California.